The House Republican Conference will meet for their annual retreat starting January 23 (well actually they retreat from conservative principles almost every day, but that’s another column) and at the top of their agenda is a sales pitch on amnesty for illegal aliens from Congressman Paul Ryan, Majority Leader Eric Cantor and Speaker John Boehner. It is absolutely vital to the future of your country that you contact your Representative to demand that he or she sign the ConservativeHQ “No Amnesty Pledge” before the January 23 retreat begins. In the past this “retreat” has been the venue where the House leadership makes the case for their agenda for the upcoming year – and browbeats and arm-twists reluctant conservatives to go along. Not this year on amnesty. The House Republican “leadership” thinks that they can postpone the vote on amnesty until after the bulk of the Republican Primary elections have passed and that somehow that will insulate them from the wrath of those voters who expect their Representative in Congress to defend the rule of law and American exceptionalism from the tide of illegal immigration that is drowning our country. 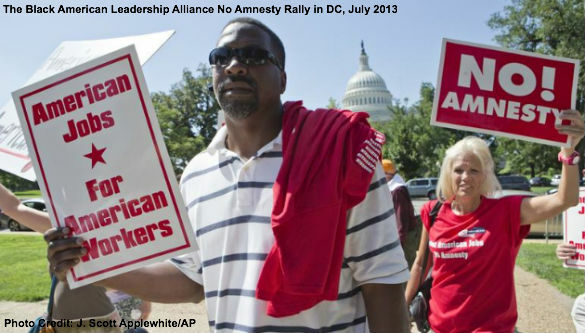 Great issues, like amnesty, are not be decided by politicians – they are decided by voters. A few months between elections isn’t going insulate any politician in Congress from the outrage voting in favor of an amnesty for illegal aliens bill will generate. We have been hoping that House Judiciary Committee Chairman Bob Goodlatte would be a bulwark against any “comprehensive immigration reform” that included amnesty, but it looks like he is backpedaling from his previous opposition to amnesty. Finding a way to build consensus on amnesty is “critical” Goodlatte told an interviewer Sunday on the Spanish-language Telemundo network. But, as our friend Neil Munro of the Daily Caller reported, Goodlatte acknowledged deep GOP opposition to the plan being touted by Ryan, Cantor and Boehner and indicated that the leadership won’t push a plan in the face of broad opposition in the Republican Conference. The only way to defeat amnesty is to keep the pressure on the rank and file Members of the House Republican Conference. The “No Amnesty Pledge” isn’t complicated; it doesn’t have any Washington weasel words in it and we will even get it up to Capitol Hill for you and publicize the response of each and every Member of Congress. The House Republican leadership – particularly Representative Paul Ryan, Speaker John Boehner and Majority Leader Eric Cantor – are expected to rollout their amnesty bill during the House Republican retreat coming up on January 23, 2014. The House Republicans’ principle-free leadership thinks so little of you that they believe they can wait until after filing for the 2014 Republican primary elections closes to put forth and pass legislation granting amnesty to illegal aliens and you will simply forget about it come 2016. Don’t let them get away with it. Click HERE to send Congress a message. Demand that your Representative take the ConservativeHQ.com “No Amnesty Pledge” today to support the rule of law and to preserve what is left of American exceptionalism. When you receive an answer from your Representative or Senator, please let us know and we will add that name to our Honor Roll of No Amnesty Pledge signers or List of Shame of amnesty supporters as appropriate.